Should Data Centers Use Ceiling-Ducted Air Containment? Data centers and all their power and energy usage generate a lot of heat. One of the biggest expenses for any data center is the cost of cooling. For this reason, data centers are always trying to develop new strategies to more effectively and efficiently keep their facilities cool while still performing their essential roles. While each approach to cooling your data center offers unique advantages, each scenario is different and what is most efficient for one data center may not be most efficient for every data center. 1. Cooling performance is strongly linked to the ceiling plenum pressure. 2. Ducted HACS can adequately cool much higher densities than individually-ducted racks at a given ceiling vacuum pressure. 3. Average cooling performance is a fairly weak function of plenum depth and rack density, with deeper plenums and lower density yielding somewhat better performance. 4. Cooling performance is moderately affected by drop-ceiling leakiness with tighter being generally better though typical plenums perform much closer to well-sealed than leaky. 5. Cooling performance is a strong function of cooling-to-IT airflow ratio with higher values being better. By utilizing a ducted air containment system in data centers, energy efficiency and reliability can be improved. As far as data centers go, these are two of the most important things any data center can do. APC-Schneider Electric concluded the following about ceiling-ducted air containment systems in White Paper 182, “Ducted air containment can simultaneously improve the energy efficiency and reliability of data centers. Since all ducted equipment, ducted cooling units, and the ceiling plenum function as a single entity, the use of CFD modeling is recommended for new deployments particularly when design constraints are close to the best-practice limits established here. In any case, deployment advice centers on ensuring an adequate and fairly uniform vacuum pressure in the ceiling plenum. 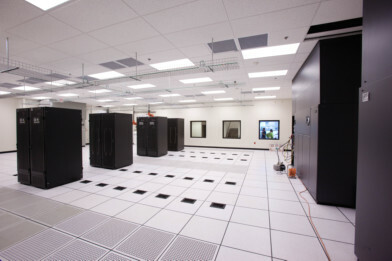 This, in turn, can be achieved by providing sufficient ducted cooling airflow, creating a relatively “tight” ceiling system, employing deeper ceiling plenums, and sealing unnecessary leakage paths in racks and containment structures.” These systems appear to work best in existing data centers and due to the uniqueness of each data center, the decision of whether or not to employ ducted air containment systems in data centers have to be taken on a case by case basis.